You are looking for the right outfit for young Rockabillies and Rockabellas? 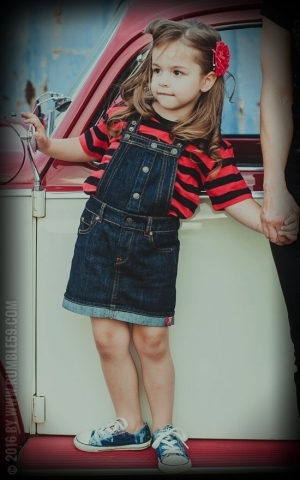 Now you get high quality kids fashion by Rumble59: cool vintage denim and shirts for the little ones - the perfect choice for every boy and girl who wants to look as good as mum and do. It pays off to be the best dressed person in the sand box. Vintage Jeans by Rumble59 are robust and long-lasting. Besides they look better than the rest. These are features both kids and their parents appreciate. These kids jeans are the perfect pants for life between playground, garden and schoolyard. With unisex jeans, denim skirts and dresses by Rumble59 there is no need anymore to be interested in mum's or dad's wardrobe. The high quality denim fabric is tough enough for wild games and chases on the playground. Who wants to look after his pants when there are adventures waiting around any corner? Every jeans looks the best with the right kids t-shirts. This is true for every age. 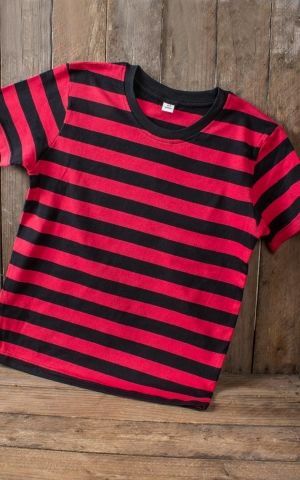 Young rebels can now choose a kids top to show their friends that they enjoy a rock'n'roll lifestyle. With their unique prints and stripes they fit girls and boys. Then it's time to grab a bike and cruise through your neighborhood. That's what rock'n'roll is all about.